More Germany posts! 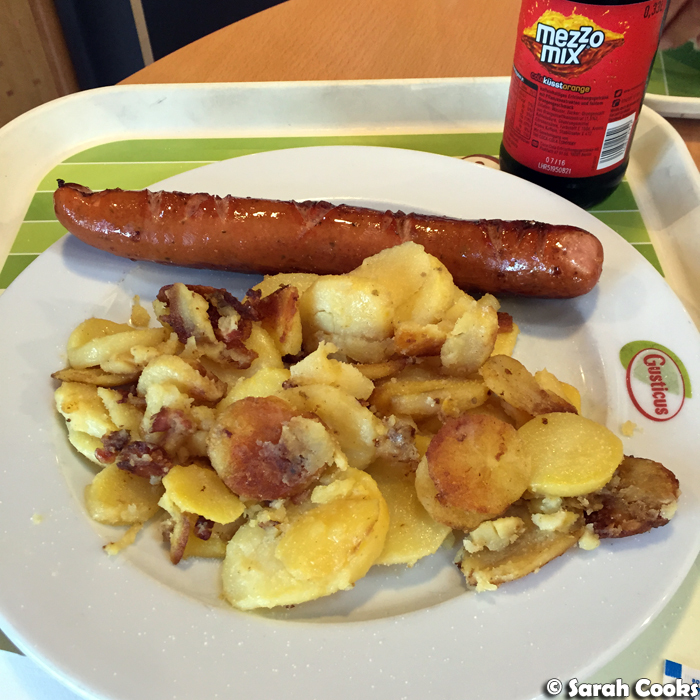 Today, I wanted to share with you some of the snacks we had in Germany - by which I mean takeaway, food court meals, and other casual snacky bites. Fun fun! Huge Turkish population in Germany. 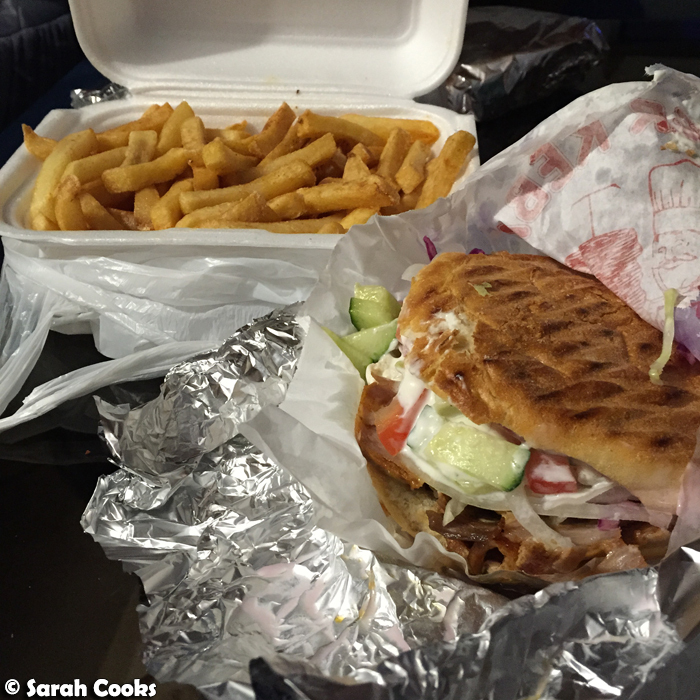 This means excellent döner kebabs! Waffelix is this chain we came across in Loop shopping centre. 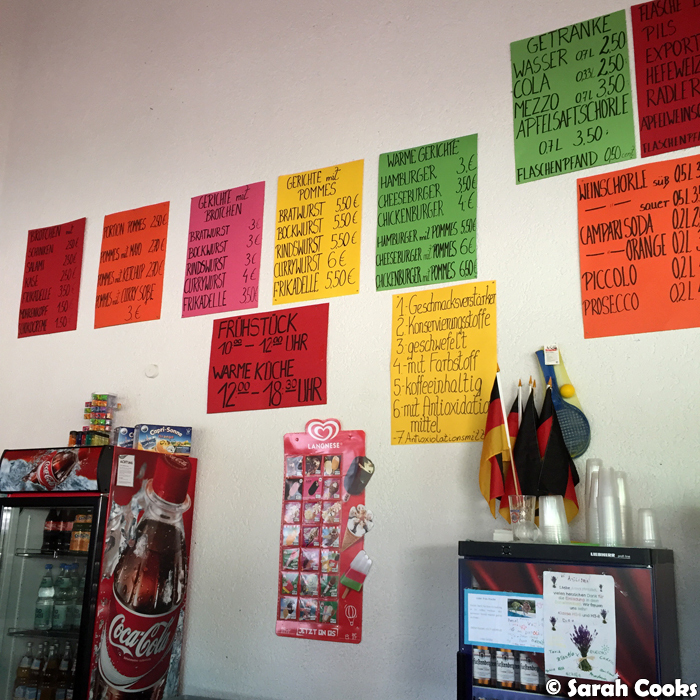 For a mere 4,40€ you can get a freshly made waffle, with your choice of two sauces (e.g. peanut butter, nutella, Spekulatius cream), two fruits (banana, strawberries, hot cherries), one mini chocolate bar (Bounty! Kinder Bueno! Kitkat! ), a topping sauce (fruit, chocolate, caramel), and a topping (Smarties, coconut, chocolate chips, whatever!) Ridiculous. I restrained myself (just! 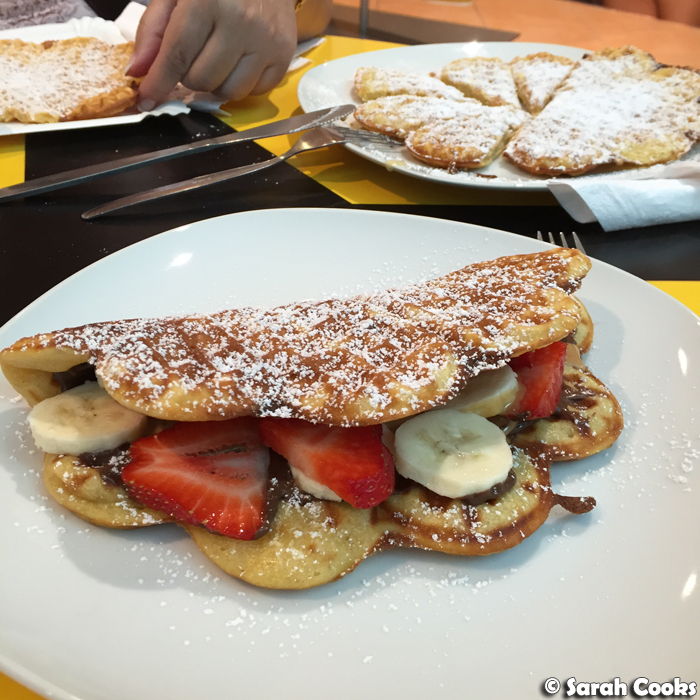 ), and had mine with peanut butter, nutella, strawberries and bananas. 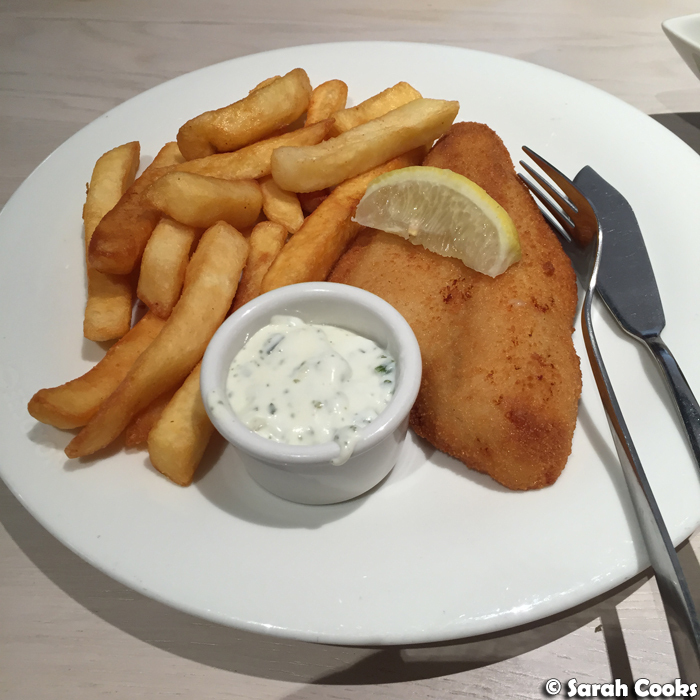 Below we have some grilled fish with chips from Nordsee, a seafood chain. 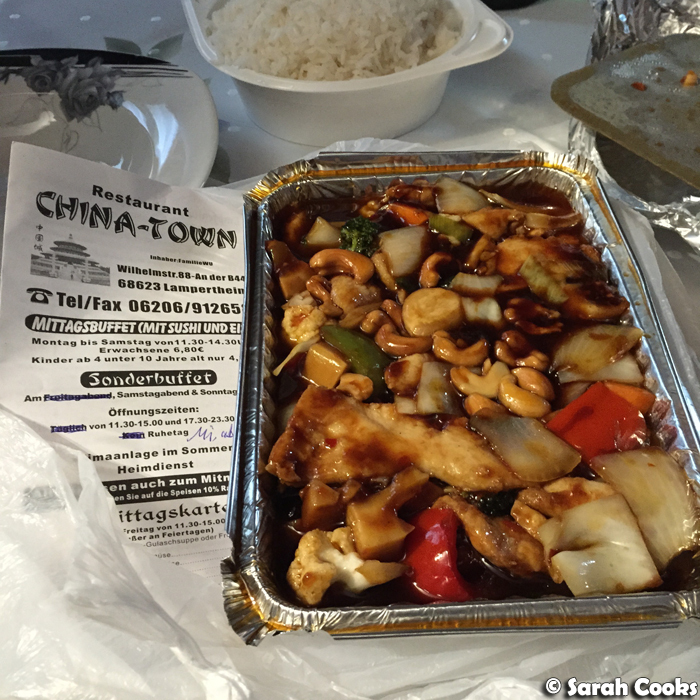 We came here for lunch one day while shopping at the Rhein-Neckar-Zentrum in Viernheim. 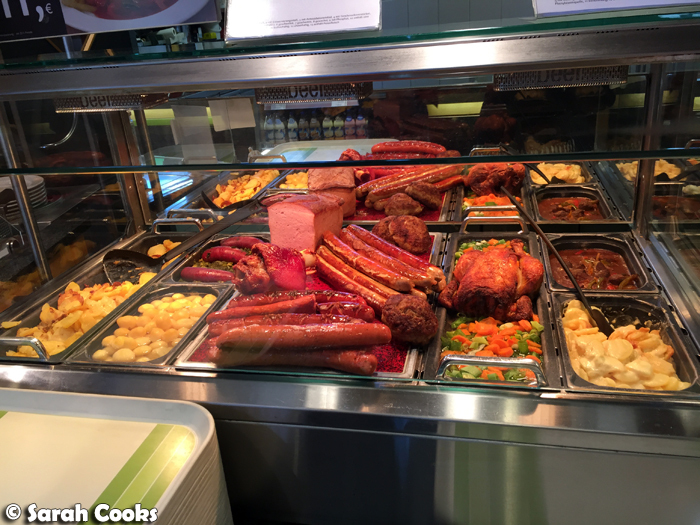 Next up we have what I think of as more traditional German snack food - sausages, fried potatoes and so on - things you can get at an Imbiss (snack house) or in those stalls next to the big supermarkets. This is the stuff I crave when I'm away from Germany! 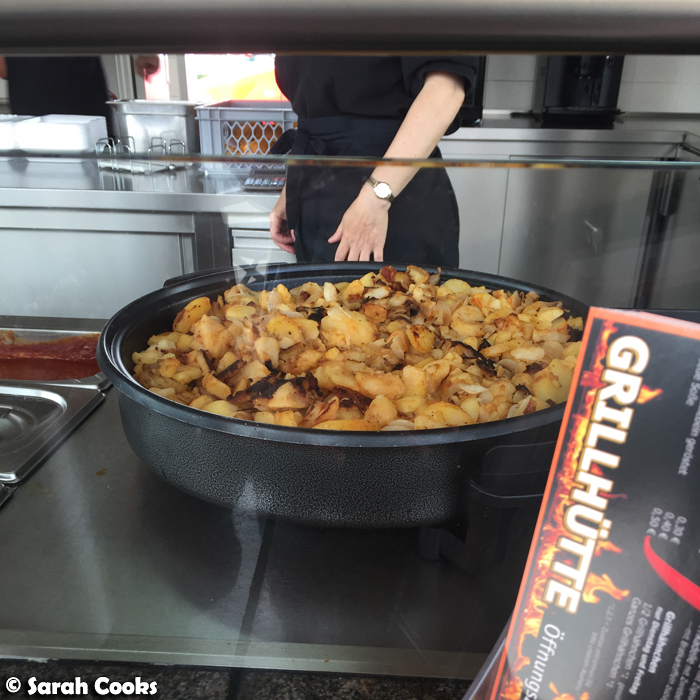 The first few photos are from the local Imbiss, Grillhütte. We came here for lunch one day when Margit was working and couldn't cook us one of her amazing lunches. 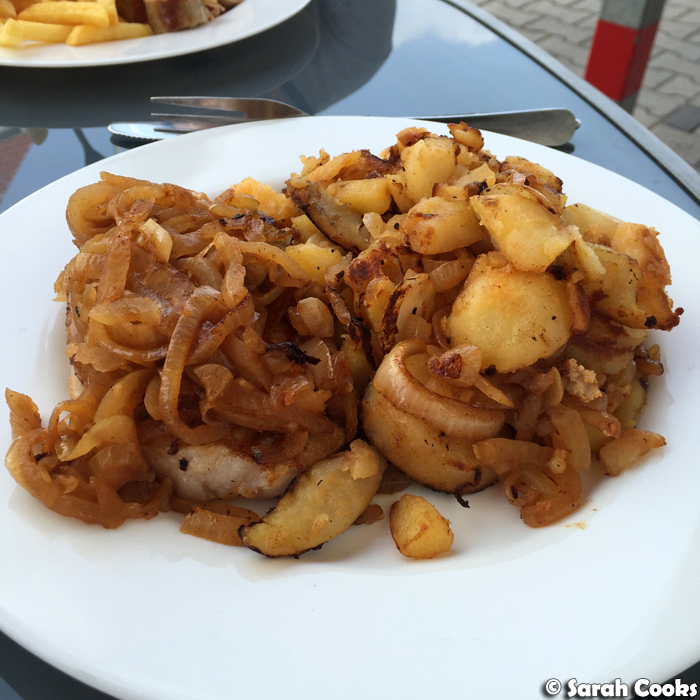 Check out this giant vat of Bratkartoffeln (fried potato slices with onions). Get in mah belly! 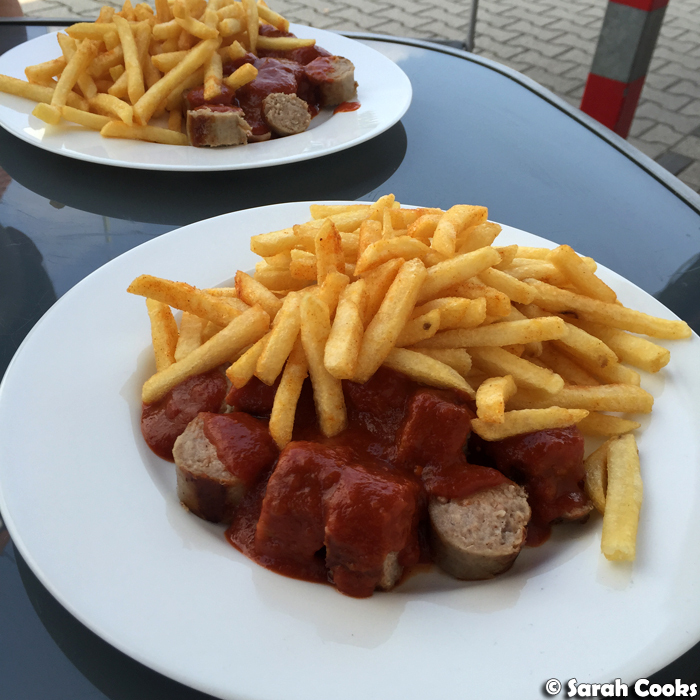 Currywurst! Best. Sliced sausage with curry ketchup and chips. Slightly fancier was this Hackbraten mit Pilz Soße und Bratkartoffel - meatloaf with mushroom sauce and fried potatoes. I can't quite remember what this was, but I think it was a pork cutlet covered in sautéed onions and served with Bratkartoffeln. 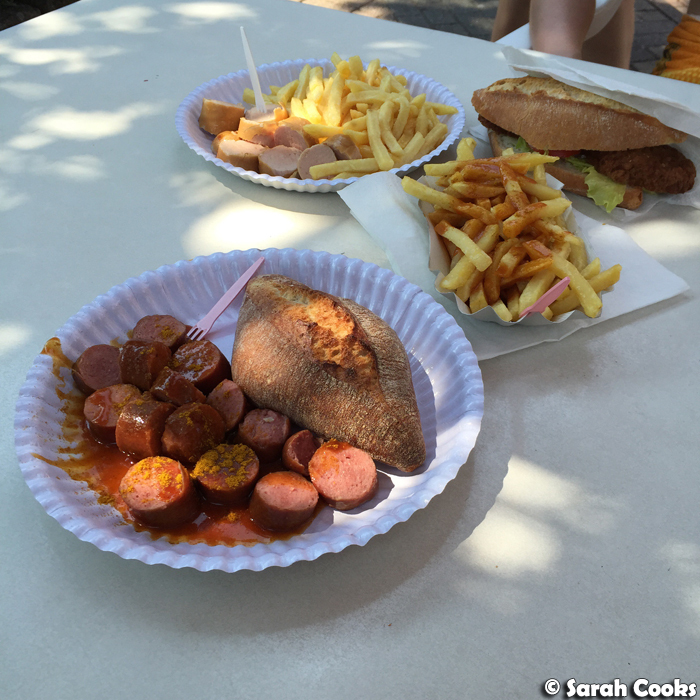 Another day, we took advantage of the gorgeous summer weather and went for a swim at the open air pool in Bürstadt... where I was thrilled to discover they had a great snack stand! That's sausage with curry ketchup and a bread roll, fries, sausage and fries, and burgers in a bread roll. Perfect bikini diet, amirite? 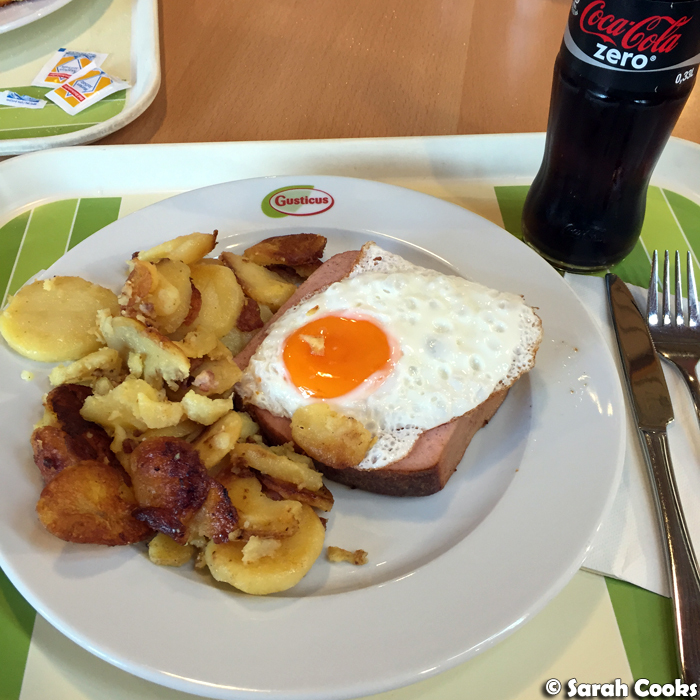 Finally, I wanted to show you a quick meal we had at Gusticus, which is a chain of German servos. This particular one was on the way back from Amsterdam. 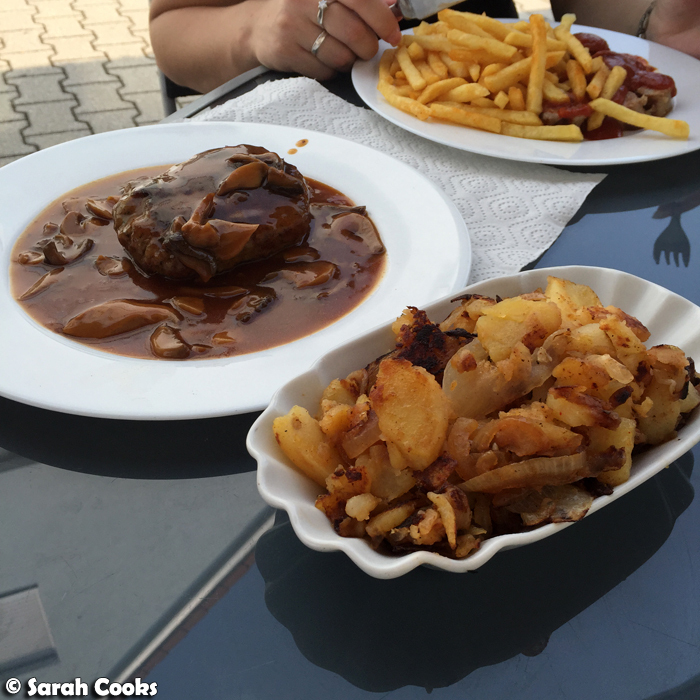 I thought we were just going to eat something small, but the portions here were huuuuuge, even by German standards! I had some Fleischkäse mit Spiegelei und Bratkartoffeln - pork meatloaf topped with a fried egg and served with more of those delicious Bratkartoffeln. Sausage with Bratkartoffeln! Incidentally, that drink on the side, "Mezzo Mix", is popular all over Germany. It goes by many other names, including Kalter Kaffee (cold coffee) or Spezzi, and is basically a mix of coke and Fanta. I don't get it, but each to their own! Gulaschsuppe mit Brötchen! 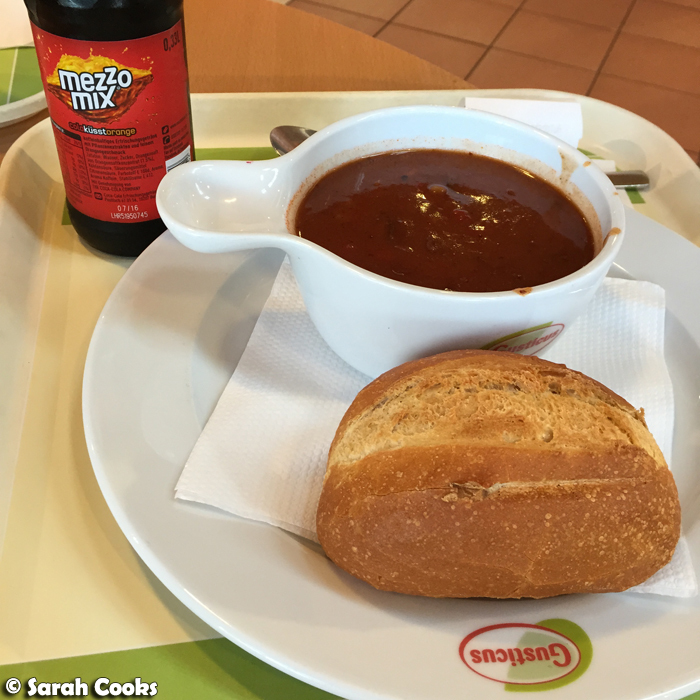 (Spicy goulash soup with a bread roll). I'm sure you can see why I've been trying to eat more healthily since we've gotten back! I think I'd just set up camp next door to Wafflelix. Yum! I an such a sucker for German snacks! And my usual drink order is an apfelschorle but I do like a Mezzo Mix once in a while! What is "Spekulatius cream" and why does that sound oh so wrong as a dessert?